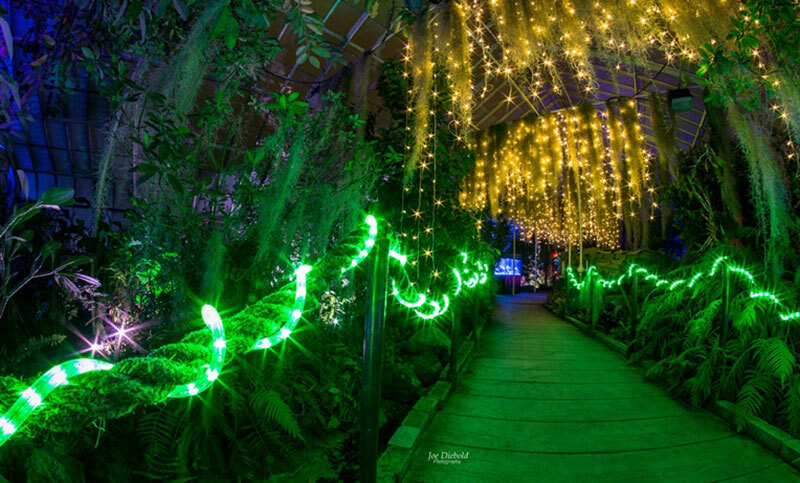 See how breezes add energy to a garden with “The Magic of Air,” this year’s theme for Lumagination at the Buffalo and Erie County Botanical Gardens. 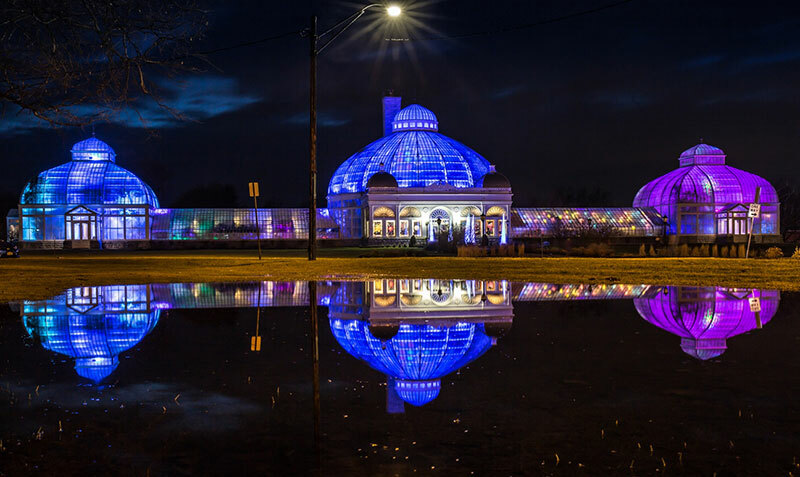 The exhibit will kick off with the Lumagination Launch Party from 6:30 to 9 p.m. Friday, Jan. 25 at the Botanical Gardens, 2655 South Park Ave., Buffalo. Guests will enjoy music, cocktails, wine, beer, glow surprises, a raffle and Nitro Magic ice cream. Launch Party tickets are $50. An exclusive VIP party will be held at the Launch Party from 5:30-6:30 p.m. The VIP party will include private access to the Launch Party, live music, signature swag, cocktails, wine, beer and more. Tickets are limited and are $75 each. Lumagination continues through Feb. 23. See details below. Lumagination will take visitors on a spectacular walk through the Botanical Gardens. As you approach the Botanical Gardens, you will be greeted by illuminated sculptures and will enter into a foyer filled with white origami cranes along the ceiling. Waves of colored light will wash over them, constantly changing the mood. Each area will have a different look. In the Main Palm Dome, swirling air will send sheets of silk dancing in the wind, with a dramatic mix of choreographed sound and light. The Aquatic Garden and Asian Rainforest will be flooded with unique light combinations, kites of all kinds and an amazing soundscape. An artistic interpretation of a tornado will stir up a storm of recycled water bottles. A new theatrical and technological design can be seen in the desert room, created by a team of professors, undergraduate students and artists from the University at Buffalo School of Theatre and Dance. Next, visitors will marvel at wind-blown trees made of neon wire and kinetic sculptures. The Wegmans Family Garden will offer interactive fun for all ages. Look down to see optical rugs with a cloud theme, then look up at the windblown pergola floating overhead. The last greenhouse will be full of twinkly lights in a mystical fairyland. Lumagination is produced by Luminated Landscapes. Lumagination will kick off with the Lumagination Launch Party on Friday, Jan. 25. See information at the beginning of this article. For the rest of Lumagination, hours are 6 to 9 p.m. weeknights and 6 to 10 p.m. Fridays and Saturdays, Jan. 26 to 27, Jan. 30 to Feb. 2, Feb. 6 to 10 and Feb. 13 to 23 at the Botanical Gardens, 2655 South Park Ave., Buffalo. Doors will open at 6 p.m. each night. Cameras and monopods are welcome every night, but tripods are permitted only on Photo Night on Jan. 29. Happy Hours were extremely popular last year and organizers added several more dates for 2019. Happy Hours will take place from 5 to 9 p.m. on Thursdays, Fridays and Saturdays, Feb. 1, 2, 7, 8, 9, 14, 15, 16, 21, 22 and 23. Admission to Happy Hour is free and food and drinks from Salvatore’s Italian Gardens will be available for purchase. The Happy Hours take place in the Administration Building, a lively space with an industrial but intimate feel. Jan. 27: Family night with the Aquarium of Niagara. Aquarium of Niagara members receive Botanical Gardens member prices. Everyone will enjoy kids activities, touch tank fun and more. Jan. 29: Photo Night. For professional and amateur photographers only. This is the only night when you may use a tripod. Cameras and monopods are welcome every night, but tripods are permitted only on Photo Night. Jan. 31: Sensory Night hosted by Autism Services. Everyone is welcome. The autism community is encouraged to enjoy this special evening. Facilitators from Autism Services will be on hand to greet visitors and discuss the benefits of sensory environments. Feb. 1: Hero Night. Active military and veterans, with valid ID, receive free admission. Feb. 6: College Night. College students, with valid ID, will receive $2 off student admission. Feb. 10: Family Night with the Buffalo Zoo. Buffalo Zoo members receive Botanical Gardens member prices. Everyone will enjoy added kids activities, animal interaction and more. Feb. 13: Pride Night with the Pride Center of WNY. Feb. 14: Valentine’s Day. The first 300 visitors will receive a special Valentine’s Day surprise. Feb. 17: Family Night with the Botanical Gardens. Everyone will enjoy added kids activities and more. The cost for the general public is $14 for adults, $12 for seniors (62 and older), $12 for students (13 and older with ID), $6 for children ages 3 to 12, and free for children 2 and younger. For Botanical Gardens members, the cost is $12 for adults, $10 for seniors (62 and older), $10 for students (13 and older with ID), $6 for children ages 3 to 12, and free for children 2 and younger. Tickets are available online or by phone at 716-827-1584, ext. 220. Tickets will also be available at the door throughout the show. Botanical Gardens’ guest passes, discounts and coupons are not valid during Lumagination.